I can't praise this beautiful book highly enough. While it is created for adults there is plenty which can be read by young adults, who will easily learn from this material. The photos alone provide excellent explanations.Jorge Daniel Taillant has particularly worked with those studying and protecting the glaciers of the Andes, the world's second highest mountain range. As water becomes ever scarcer and more expensive the ice locked in glaciers is shrinking and needs protection. Taillant founded and works with the non-profit Center For Human Rights And Environment (CEDHA) and has contributed to experts' meetings of the United Nations. 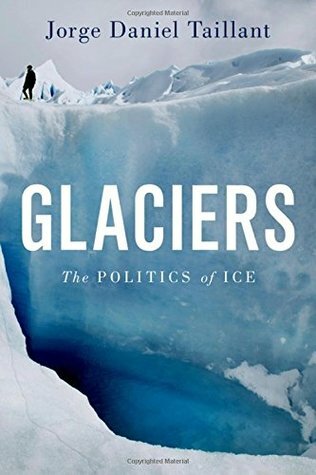 The chapters alternate as the author summarises the lengthy political decision-making process and bureaucracy required to enact the first glacier protecting laws in the world. This occurred in Argentina in 2008, and before the statutory ten day period was up, the president of that country had been phoned by a mine firm official and persuaded to nullify the law. Mining, particularly for copper, gold and silver, is Argentina's biggest industry and mountains are mined in open fashion, not by tunnelling. The glaciers were in the way. After a two-year discussion process and campaign by activists, who coined the slogan "Water is worth more than gold", a new law was finally enacted.The other areas covered include fascinating facts, with many GPS references to type into a search engine to see glaciers before they shrink and vanish. We learn new words from the science of glaciology and see how snow crystals are compressed by weight of more snow to form ice. We hear the one about the man jailed for stealing glacier ice to serve more interesting bar drinks; counter it with the tragedy of a town destroyed and thousands of people killed when a lake formed by a melting glacier burst its moraine dam during an earthquake. While South America is the main land studied, the other glaciers of the world are coming into sharp focus - see 'Meltdown in Tibet' by Michael Buckley to discover what China is doing with rivers of ice which start in Tibet and run as major rivers to other Asian countries, like India. Or 'The Price Of Thirst' by Karen Piper which looks at how the water gets to the people worldwide, or doesn't if they don't pay for it. Reading Jorge Daniel Taillant's powerful, accessible and wistful book will give you all the tools you need to understand the increasingly important politics and dynamics of water and ice. This comes highly recommended by me. I just read a great book about glaciers! There's so much I want to sort through in here.The book is by Jorge Taillant, who is a glacier activist in Argentina. He was somewhat involved in the process of the passing of the first glacier protection law in the world. Right now in Argentina, it is mining that is the greatest threat to glaciers, rather than global warming, although warming is not far from anyone's mind when they talk about glaciers. So I learned a lot about ice and glaciers (rock glaciers, active and inactive glaciers, all kinds of glaciers) and a lot about politics in Argentina, both of which were interesting to me. It turns out that we as humanity are still learning about what glaciers do for us, just when we're in danger of losing them altogether. Taillant thinks we should stop just wringing our hands about this and do something. I confess I was previously in the camp who thought that there was nothing we could do, other than work to reduce greenhouse gas emissions. Evidently there are some steps that can be taken specifically to protect glaciers.This story was intriguing, with the surprising ins outs ups downs of Argentinian politics, and the relationships between governments, mining companies, and environmental agencies. At first I thought the political story would be quite boring, since I'm more interested in science than politics in general, but then there were some jaw-dropping moments that hooked me. But I think the real message here is about glaciers and glacier education. Taillant handles the science really well, using metaphors to explain the motion of rocks and ice and proposing home experiments. He also includes ways to look things up on Google Earth, a feature that at first I ignored but eventually got too tempting to bypass. Having Google Earth up on my computer made the experience much more amazing (but slower reading).So I loved this book. But I will warn that it is written by an activist, and so the text is definitely biased. There are more exclamation points and italicized words than in most science-related books, and some corny story-telling tricks (or so they thought). But the enthusiasm of the author is forgiveable and contagious. I learned a lot and wanted to learn more, so I think his goal of educating the public and spreading the word as far as I'm concerned.I got an early print of this book from NetGalley, so I may have to wait a while to discuss it with someone. .. I thought I was going to have to slog through this, continuously forcing my brain to focus on the words and ideas. Instead I felt like a smart cookie! It had a relaxed writing style that made it very easy to follow along, despite the fact this is a scientific topic steeped in foreign politics. Science and political science were not my strong points in school, so it was with some trepidation (and yet, some strong interest) that I picked this up. Taillant's style of writing makes this a pleasure to read. It was not dry or a drag. If anything, it felt like a very earnest fellow sitting me down and talking to me about an important issue that everyone's brushing under the rug. I am amazed at how much he knows about this, and that knowledge definitely shows through in here. I was amazed at how long some of this stuff has been in process. Long before the climate change craze, Taillant was working on the machinations behind the politics for environmental conservation. He makes a good point: it is easy to brush off their calls for help, because glaciers seem so far removed from us (especially here in southern California where the coldest we get is 65 in an average year). But when he throws those figures at you--the ones about how glaciers are our biggest freshwater supply, which just melts into the saltwater ocean and becomes useless to us for drinking and agriculture--it is hard not to be a little worried about the situation. But rest assured, Taillant is on the case! He has been working tirelessly with this, and Glaciers gives quite a bit of useful information. Toil on, Taillant. We're with you. There are a lot of great nuggets in this book, but it is so poorly written and so haphazardly structured that it's miserable to read. The author spends far too much time on the local political gossip related to a glacier law in Argentina - a shame because buried in all that trivia was a really interesting scientific/legal battle. Every other chapter is focused on the science and geology of glaciers, including a chapter called "Amazing Glacier Stuff" (no joke, that's really the title), which is just as much of a grab-bag as it sounds: everything from a description of how atmospheric information is captured over time in visible glacier strata to... an overview of ice-related pop-culture figures, including Ella from Frozen and Frosty the Snowman. What? Glaciers are cool, ok terrible puns aside, they are a fascinating and vulnerable thing with a vital impact on our ecosystem (on both a micro and macro scale). This book is very clear and down to earth with its science and history, I get the feeling it was written with adults and older children in mind, and it works for both. I think my favorite thing was the coordinates you were encouraged to plug into google earth allowing you to see specific glaciers, way to blend technologies. Overall I really enjoyed this book, especially the approach to climate change and global warming. Well researched and written. From Netgalley for a review.